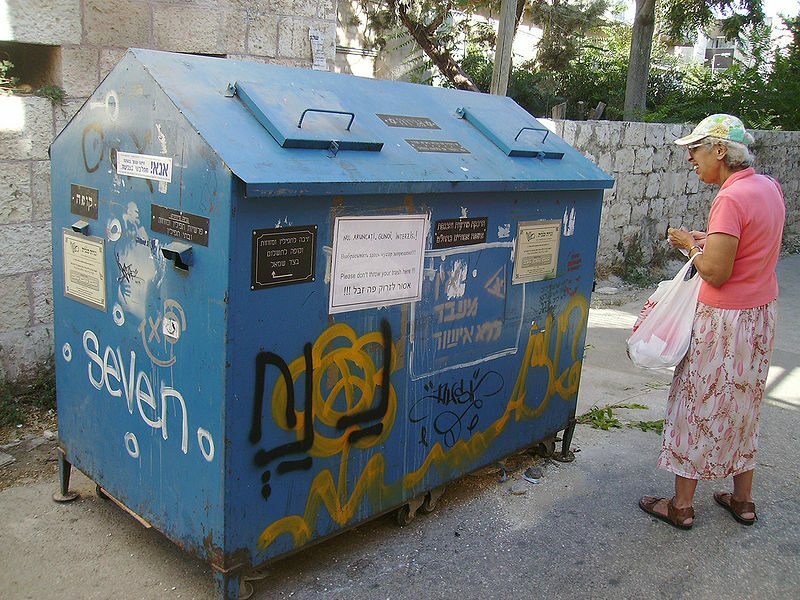 Geniza on the street in Jerusalem. Photo by Flickr user Ask?. My first reaction was an unsettled, “What the heck?” Followed by a pissed, “Wow, way over the line.” Finally settling on, “Crap—now what?” From the back cover of the Nass, the Hebrew name of God, the holy Tetragrammaton, was staring up at me with the menacing grin of a camper who just got away with stealing food from the kitchen. From our rather unholy publication, in an article titled “Kanye West’s Top 20 Baby Names,” I saw the letters referred to as the Unutterable Name, the Distinctive Name, the Ineffable Name. Sorry, my bad. I meant: the Unutterable Name (except by the Nass), the Distinctive Name (except by the Nass), and the Ineffable Name (except by the gosh-damn Nassau Weekly). The sanctity of God’s name is not merely a Jewish concept, evidenced clearly by my use of “gosh” above as a replacement for “God.” Throughout history, the holiness of this combination of letters—which I will henceforth designate by the transliteration YHWH—has informed two primary categories of prohibitions: that of speaking the name aloud and that of discarding it once written. Put simply, no Jew is permitted to pronounce the letters YHWH and its cameo in the Nass means we—which will henceforth designate the Jewish community—are prohibited from desecrating God’s name by throwing those editions out. He hit the nail right on the head. This problem embodies the tension created by stuffing religion into the intellectually suffocating box of college. Wait, you say, isn’t a University the epitome of intellectual openness, the paradigm of all academic pursuits? Specifically and exclusively academic, yes. But a religious lifestyle cannot be wholly academic; the leap of faith and fear/love of God that is a prerequisite to a religiously oriented life is checked at the door of any university’s Department of Religion. (Why do you think Princeton has an Office of Religious Life separate from its Department of Religion?) College is the period in which students are routinely exposed to faith-busting courses on the human origins of the Bible, subjecting religious text to the same academic rigor applied to every other discipline. The Nassau Weekly’s desecration of God’s name merely reflects the wholesale secularization of religion that embodies the heart of academia and destroys the soul of faith. A classic campus shayla. For anyone attuned to it, this discourse materializes all over the place. At least all over certain places. It’s present in that awkward moment when, in a speech to the Jewish community, a student slips and mentions the “authors” of the Hebrew Bible. It’s the awkward moment in JDS 306: Elementary Biblical Hebrew when a non-Jewish student asks how to pronounce YHWH. Or the awkward moment when a Jewish student stutters reading a verse that includes one of 6,828 times the Tetragrammaton is printed in the Hebrew Bible because he or she is caught between a religious tenant and the academic textbook. “No, no,” the teacher explains, “if it’s for educational purposes, it’s fine to say Adonai.” “Oh,” they sigh as they sit back into their seats. Or does this awkward shifting in our chairs when confronted directly with God’s name reflect a much deeper issue? Are we, as a religious community, simply uncomfortable talking about God in the first place? It’s not outrageous to think, perhaps, that being so engulfed in a community focused exclusively on academia makes it embarrassing to acknowledge a force that is extra-academic. In a culture addicted to the façade of being in control, does acknowledging our humanity and dependence on a Higher Power admit too much weakness and vulnerability? Are we so angry because Kanye, in his freedom to possibly name his stupid baby YHWH, can do something we never could: be mindless, be completely objective, be detached from and disinterested in this embarrassing, annoying, and inconvenient sacredness? Regardless of the reason, Jews still exhibit a collective sensitivity and anxiety when confronted with the name YHWH. Our obsession with the Tetragrammaton (which, by the way, means ‘four letter word’ in Greek; one of the only holy four letter words out there… besides ‘holy’ I guess.) hearkens back, not only to our personal childhood memory, but also to our historical communal memory. At one point in time, most scholars agree, the Name was actually pronounced as a greeting. By the Second Temple period, YHWH was pronounced only by the High Priest in the Temple on the holiest day of the year, Yom Kippur. By the first centuries of the Common Era, the foundational text of Jewish law, the Mishna, asserts that those who pronounce YHWH will lose their share in the world to come. Apparently then, the Nassau Weekly staff should enjoy this world while they still can. Now that the papers have already been printed and distributed, only a few options remain: (1) Crusade through the night, burning down Bloomberg and The Packet (printer of the Nass) with unforgiving vengeance; (2) Drink dangerous quantities of alcohol, obsessively circle campus collecting every copy, throw them all in the garbage, and wake up the next morning to find the problem solved, but thankfully have no recollection whatsoever of the previous night’s escapade; (3) Employ a rescue squad to locate and seize all extant copies of that issue, discarding them into the CJL’s bin designated for such holy papers (called a “genizah box”) until their eventual ritual burial; (4) Turn a blind eye (the other cheek, if you will) and pretend like nothing happened. With these in mind, Rabbi Wolkenfeld and I discuss his deliberations with his own rabbis. Rabbi Dov Linzer, the head of Rabbi Wolkenfeld’s rabbinical school, inclined towards more stringent methods and intimated the responsibility of Jews on campus to collect and discard the copies in the genizah accordingly, while understanding that stealing a stack of 25 Nassau Weeklies from the Forbes lobby is ridiculous. Rabbi Yaacov Love, chair of the Department of Jewish Law at the same institution, tended towards a more lenient approach, arguing that the printed name is merely referring to a baby in a secular context and not infused with the religious significance of God’s name. Therefore, we are permitted to recycle them, a more dignified option than discarding them in the nauseating garbage soup that will disintegrate the paper in the trash. Some opinions even hold that all photocopies of YHWH, which are clearly intended to be more temporary than a printed book, can/should always be recycled. My gut reaction to seeing YHWH in such an unholy context comes from our compulsive communal need to preserve the sanctity of our tradition. We are terrified even of the tiny cracks in our towering walls that scream: “This is my God and I will always defend His name.” It’s not necessarily a bad reaction—it keeps us vigilant, respectful, ever-reverent of a Higher Power. On the other hand, college is the time to push the boundaries of our comfort zone and maybe the Nassau Weekly’s slip-up presents us with a unique opportunity. Our other guest at breakfast, Professor Marc Hirschman from Hebrew University in Jerusalem, joked about some vandal who keyed YHWH into a bathroom stall door: “No one knew what to do about it or how to remove it. But we had to do something. Writing God’s name in the bathroom was just causing an uncontrollable plague of mass constipation.” Maybe once in a while, there’s also room to laugh at ourselves, even just a little.